Taken from the shoulder part of cattle. Rough texture, sinewy and tough meat. Contains moderate amount of fat in beef, and therefore has good flavor. This cut of beef tends to get more marbled than other beef cuts. Fine texture and good quality. Commonly known as steak beef. Marbled beef with fine texture, tenderness and sweet flavor. Smooth and fine texture, very tender, and less fat. Lean meat from thigh of cattle. Particularly tender beef with less fat than other cuts from thigh. 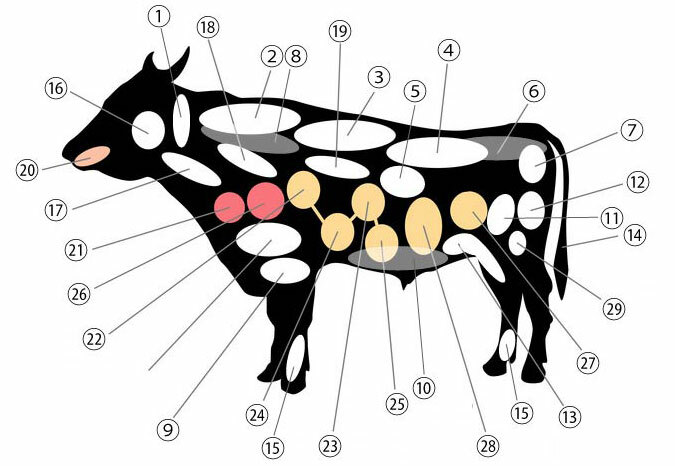 Beef from the hip joint of cattle. Very scarce. Mixture of lean meat and marbled meat. Lean meat with rich flavor and dense taste. Beef belly taken from the outside of the cattle’s ribs. Marbled beef with rich taste and flavor. Generally called “Kalbi”. Known well as steak beef. Fine texture, tender and sweet. More marbled fat can be seen than other cuts of beef. Beef cut from the out side of thigh. The texture is slightly rough and the meat is slightly tough. Beef cut from the heart of lean meat. Less fat and rich protein. Taken from the tail of cattle, contains a good portion of collagen. This cut of beef is sinewy and tough. Rich in collagen and taste. The cheek muscle in the face of cattle. A tough lean cut, but has moderate marbling. Tenderness increases when sliced. The cartilage in the throat of cattle. It has a typical characteristics of cartilage, the crunchy texture. The lower part of the shoulder blade. It is a less fat lean with tough texture, but more marbled than other parts around the forefoot. A thin part of the diaphragms’ back side. Although it looks like a lean meat, it is an organ meat. The taste and texture are also like lean meat. Cattle tongue contains low fat. Its texture is chewy with a distinctive graininess. The texture is rather tough and chewy, but it has a robust taste of the typical muscular organ. The first stomach. The texture is tough, but it becomes nice and crunchy by scoring with a knife. The second stomach. A springy and chewy texture with light taste. The third stomach. It is often eaten as Sashimi (raw). Its crunchy texture is unique among other hormones (guts, organ meats). The fourth stomach. Also known as “Giara”. The texture is crunchy. Contains less fat than comparing to other hormones (guts, organ meats). The fresh liver has a chewy texture and little smell even served raw. The most soft part of the Large intestine. The texture is more tough and springy comparing to the small intestine. A fatty meat with a very tender texture that will melt in the mouth. The womb has a rather tough texture.